The EU plays a dominant role in global egg trade. EU member countries contribute over 55% to egg exports and share over 50% in egg imports. Here, intra-EU trade of eggs is included. The Netherlands are the leading egg exporting country with a share of 17% in the global export volume and Germany is the leading egg importing country with a share of almost 25% in the global import volume. Shell eggs for consumption are mainly traded only over short distances as they cannot be deep-frozen. That is why trade between EU member countries has to be distinguished from trade of the EU with so-called third countries. Table 1 and Figure 1 show that egg and egg products exports to non-EU member countries surpassed imports considerably. Between 2012 and 2016, exports increased by 61,000 t or 32.8%. The high export volume in 2015 is a result of the Avian Influenza outbreaks in the USA (Windhorst, 2016). To fulfil their contracts, the egg processing industry was forced to import eggs for further processing and egg powder. The decrease of egg and egg products imports resulted in a growing positive trade balance. In Tables 2 and 3, the trade relations at country level are documented for the years 2012, 2014 and 2016. A comparison of the main countries of destination and their ranking in the three documented years shows as well the growth of the export volume as the decreasing regional concentration of the exports (Table 2). While in 2012 the five leading countries shared 67.4% of the total export volume, their contribution in 2016 was only 51.2%. 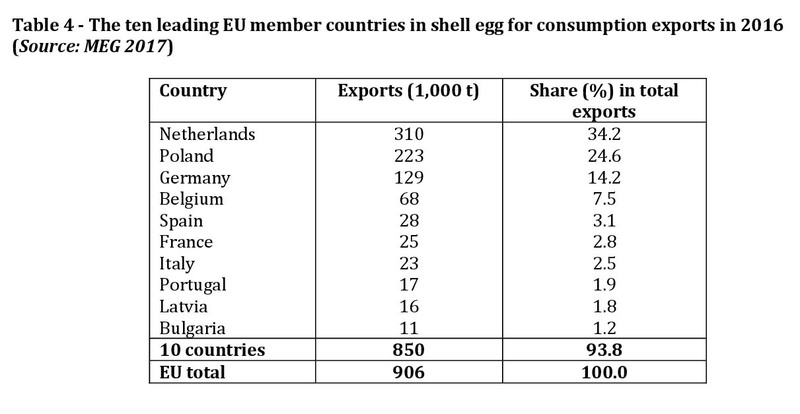 Quite obviously, EU member countries were able to develop new markets for shell eggs and egg products. The main countries of destination in all three years were Japan and Switzerland. Their share in the total export volume to non-EU countries fell, however, from 58.6% in 2012 to only 35.0% in 2016. While the import volume of Switzerland remained fairly stable, Japan imported over 20,000 t less in 2016. The reduction is a result of the AI outbreaks in several EU member countries. Imports to the United Arab Emirates, Israel and the USA increased considerably. Because of the Russian import ban, no exports were possible in 2015 and 2016. Imports of eggs and egg products fluctuated considerably in the analysed time period (Table 3). Between 2012 and 2014, the import volume decreased by 23,840 t or 36.4%. Until 2016 it recovered, but the exports were still about 20,000 t lower than in 2012. The regional concentration also fluctuated considerably. While it reached values around 83% in 2012 and 2016, it fell to only 47.5% in 2014. The share of the USA in egg and egg products imports fell from 40.5% to only 20.1%. Argentina also lost market shares while Ukraine advanced to the main country of origin. The USA, Argentina and Ukraine mainly exported egg products, for Albania no specification is available. While trade data with non-EU countries are only available for egg and egg products together, trade data for shell eggs as well as egg products are published separately at member country level. From the data in Table 4 one can easily see that the regional concentration in egg exports is very high. The Netherlands and Poland alone contributed 58.8% to the total export volume of the EU member countries in 2016. 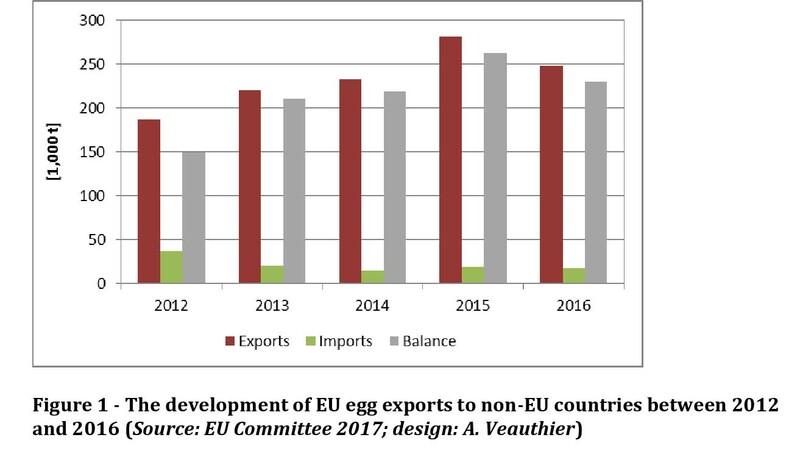 Most of the traded eggs remained in the EU, for only 85,100 t or 9.4% of shell eggs were exported to non-EU member countries. The comparatively high exports of Germany are surprising at first sight, as the self-sufficiency rate was as low as 67%. A considerable amount of the exported shell eggs was produced by Dutch owners in eastern Germany and then shipped to the Netherlands where they are either further processed or re-exported as shell eggs. These eggs are counted as exports in the EU statistics. 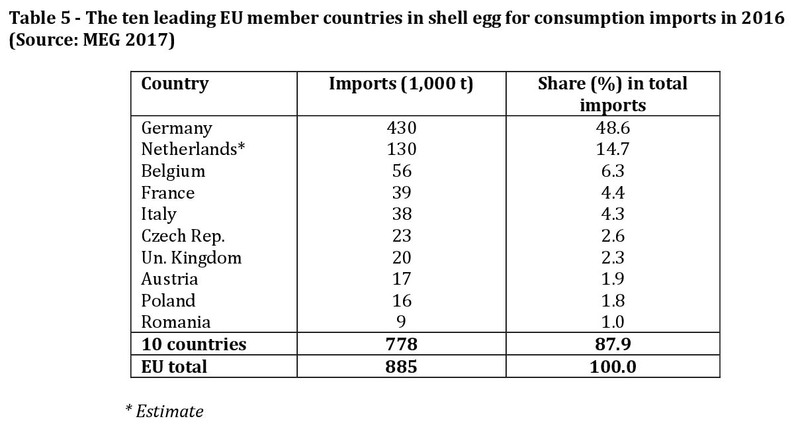 As was already mentioned, most of the egg trade in the EU is trade between member countries. Table 5 shows that 885,000 t of shell eggs were imported in 2016. Of the import volume only 1,500 t or 0.2% came from non-EU countries. Germany ranked in first place with a share of 48.6%, followed by the Netherlands with 14.7%. As no exact data for the Netherlands are available, the import volume is estimated. Germany has been the leading egg importing country for many years. 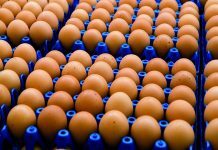 Of the almost 7 billion eggs which Germany imported in 2016, 5 billion or 71.7% came from the Netherlands and 18.9% from Poland. Germany was the main market for both Poland and the Netherlands. The EU is dominating global egg trade. More than half of all eggs which reach the international markets are either exported or imported by EU member countries. The Netherlands are the dominating egg exporting country, followed by Poland. Germany holds an unchallenged first place among the leading egg importing countries. It is expected that between 2017 and 2025 egg production in the EU will grow faster than consumption resulting in an increasing egg surplus. 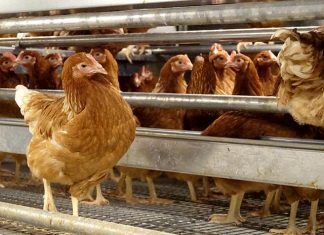 If this cannot be exported either as shell eggs or as egg products, a lasting phase of low egg prices may be the result. Committee for the Common Organisation of the Agricultural Markets (Ed. ): EU Market Situation for Eggs. Brussels, August 27th, 2017. MEG-Marktbilanz: Eier und Geflügel 2016. Stuttgart 2016. MEG-Marktbilanz: Eier und Geflügel 2017. Stuttgart 2017. 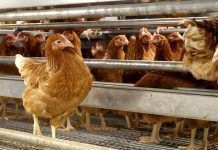 Windhorst, H.-W.: The Netherlands – the leading country in European egg and poultry meat exports. In: Zootechnica international 38 (2016), no. 1, p. 32-38. Windhorst, H.-W.: Germany – remarkable recovery from the earlier banning of conventional cages. In: Zootecnica international 38 (2016), no. 3, p. 36-41. Windhorst, H.-W.: Economic impacts of the AI-outbreaks in the USA in 2015. A final evaluation of the epizootic disaster. In: Zootecnica International 38 (2016), no. 7, p. 34-39. 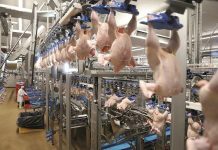 Windhorst, H.-W.: The EU Egg Industry in Transition. London: International Egg Commission April 2017. 31 p.
Windhorst, H.-W.: Poland – growing importance of egg exports. In: Zootecnica International 39 (2017), no.6, p. 26-29.